Before going to Ærø, I had done a bit of research on what to see whilst on the island. This place was definitely the one I was looking most forward to visiting and luckily, it didn't disappoint whatsoever! Vesteraas is an ecological small holding in the middle of the island surrounded by the preserved nature reserve Voderup Cliffs. On these twenty hectares, the owners Nils and Maja are taking pride in bringing the fields back to their original and natural state. That means no chemicals, no fertilizers, no tractors; just Nils, his bare hands and several bee, butterfly and frog species that you will only find here and nowhere else in the world! Nils has a pack of Dexter cattle that are out enjoying themselves on the fields 365 days a year, rain or shine. From these, he makes the island's world known sausages, that you can not leave Ærø without having tried. Vesteraas has a fruit garden as well, and apples, plums, berries and nuts are at your disposal. 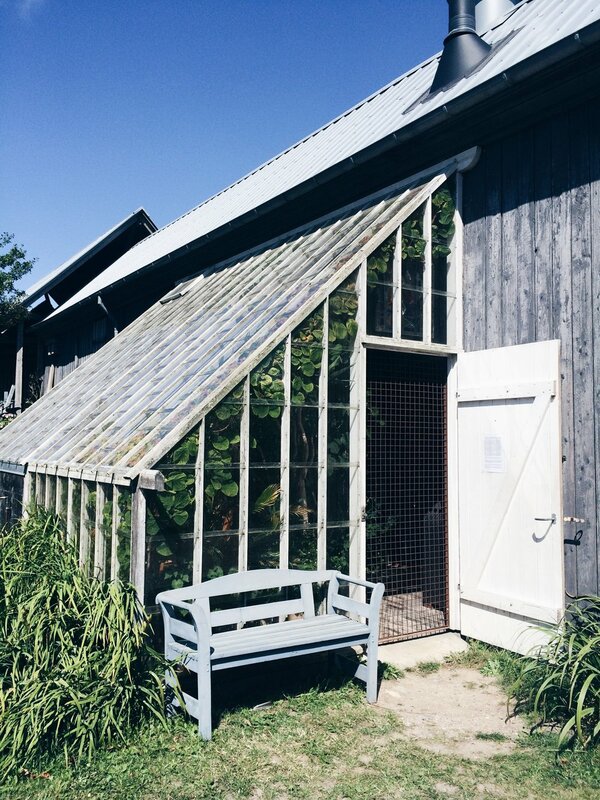 It is not difficult to feel a little excited about this place that also has two houses for rent; The Greenhouse and The House Towards The Sea (love that name!). Built in natural and sustainable materials, these two houses each fit a whole family (and then some) and holds everything you need to feel at home; bedrooms, common rooms, bathrooms, kitchen and even a garden belonging to each house. In The Greenhouse bathroom, guests are often a little surprised when looking up from the toilet; here is a small round window looking directly out to the stables at eye level with the bull and the cows. That's exactly how close to nature you are at Vesteraas!